I think I went thru some kind of post holiday withdrawal. Holiday withdrawal + sugar withdrawal = not good. It was a sad sight when I saw all our neighbor’s Christmas trees left on the side of the street. The holidays are finally over. I’ve been sick all week, but I am better now. While I was sick, I became best friends with Zicam and Vitamin C, I took them everywhere with me. I took it easy on the workouts. I did absolutely nothing for 3 days, then walked on the treadmill the last few days. Tomorrow, I am resuming my half marathon training with an early run at the park. Please send some good running vibes my way. Now I want to share my first recipe of the year. 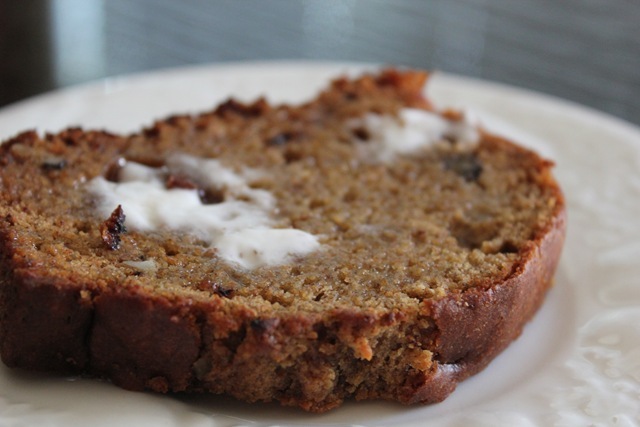 A healthy-ier recipe for a quick bread. Chris has been bringing persimmons home from work. His coworkers gives them away from their bountiful tree. I like the Hachiya persimmon the best. I like it’s crunchy and sweet texture. But once they are past that point of perfect ripeness, they turn mushy (similar to a banana). 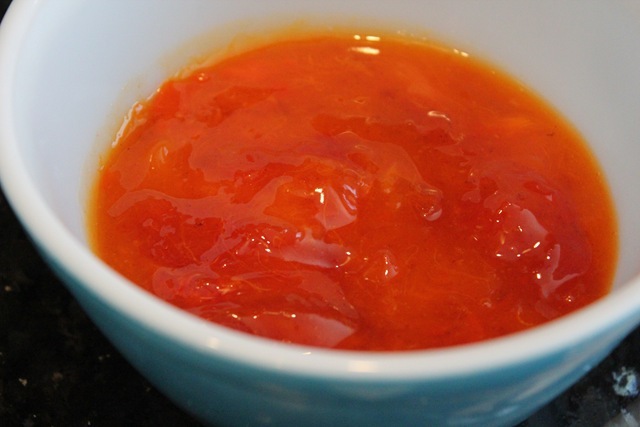 What to do with overly ripe persimmons? Bake with them, of course. You start by pureeing your persimmon. I cut the ripe fruit in half, scooped out the pulp with a spoon and used a mini-chopper until smooth. Mix your wet ingredients with your dry ingredients. 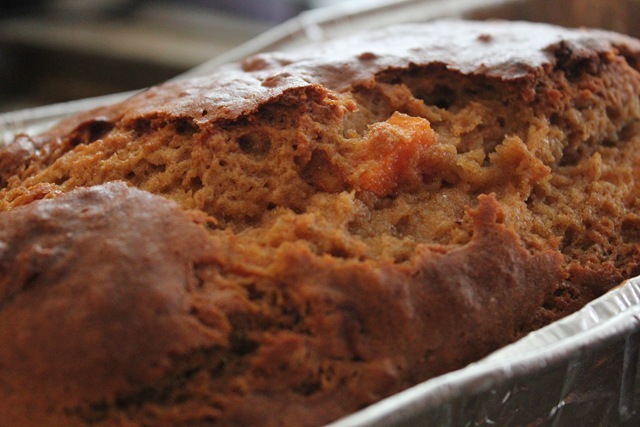 See the persimmon chunks in the batter? 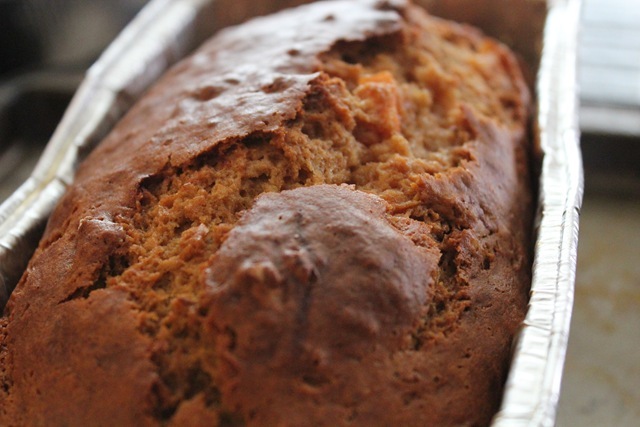 Now see the persimmon chunks in the bread? I lowered the sugar amount from the original recipe and it taste perfect for me. It’s mildly sweet, something you would eat with tea in the afternoon. Weigh or lightly spoon flour into dry measuring cups: level with a knife. 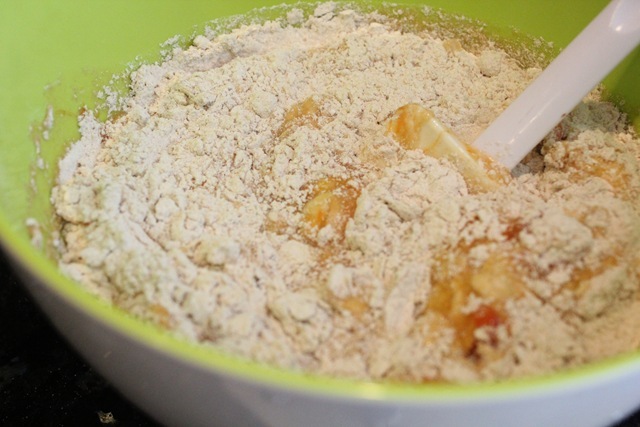 Combine flour, baking soda, and salt in a large bowl. Stir with a whisk. 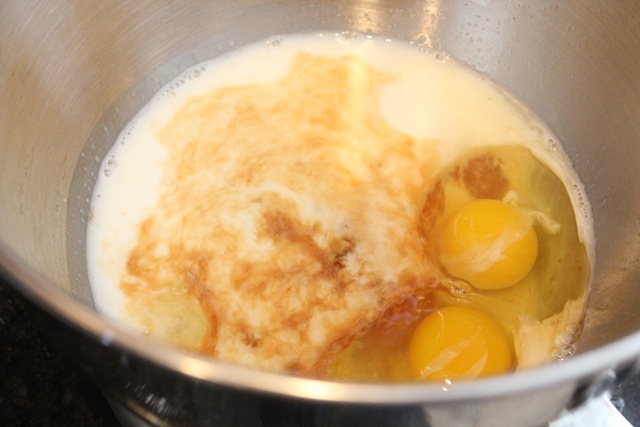 Combine sugar and next 5 ingredients in a medium bowl; beat with a mixer at medium speed until blended. 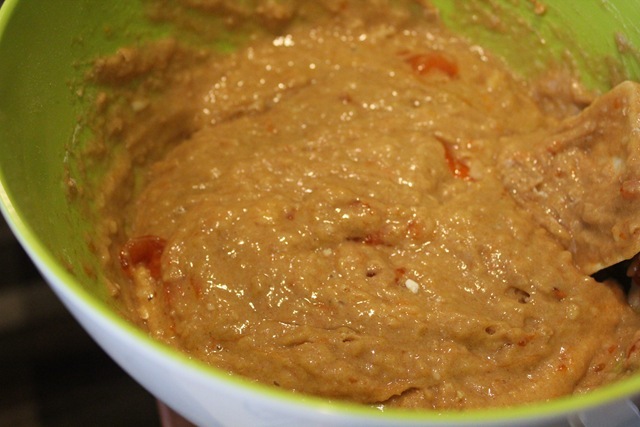 Add persimmon mixture to flour mixture, stirring just until blended. Stir in walnuts and raisins. Spoon batter into 2 (8×4-inch) loaf pans coated with cooking spray. Bake at 350 for 45 minutes or until wooden pick inserted in center comes out clean. Cool 10 minutes in pans on a wire rack; remove from pans. Cool completely on wire rack. 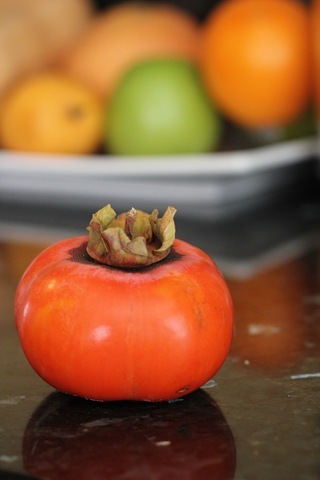 Note: To speed the ripening process of the persimmon, freeze the fruit overnight or until solid. Thaw the persimmon; when soft, it will be sweeter and less astringent. I gave the second loaf to my parents. A healthy start for the new year for them. I’ve been enjoying this bread every day. Sometimes toasted for breakfast with scrambled eggs. Other times, toasted and crumbled over greek yogurt for afternoon snacks. Feel better!! Ive never had one and am totally intrigued! Homemade bread makes the breakfast/snack! Good luck with your half marathon training and feel better! Persimmons are one of my FAVORITE fruits! 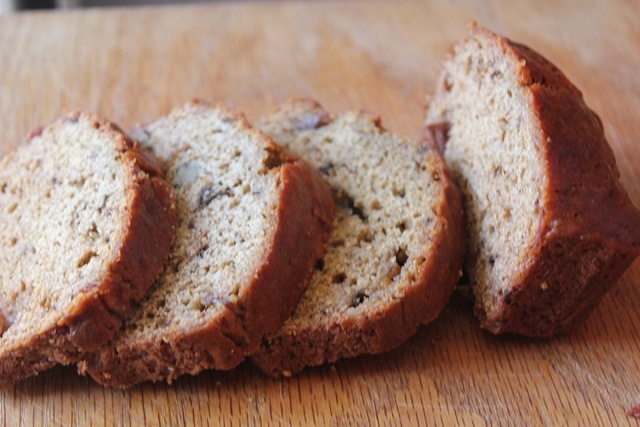 This bread sounds like such a delicious way to get them into your life on a daily basis! Wish you made this like 2 months ago! My boss gave me a bag of persimmons and I had no clue on what to do with them. I made a crisp, but that was about it! Your bread looks amazing and super moist!